In this business world, small and medium business peoples are feeling difficulties to manage their invoices and transactions. So Phpscriptsmall developed PHP Billing and Invoicing Software to meet every entrepreneur for simple invoice and billing operations. In our script, you can control all the order and invoices from the single dashboard and can manage the customer database online. The website owner can add unlimited customer and send the invoice to the customer within the certain period of time.Our PHP Invoicing script is easy to bill your clients and get them paid.This Invoice management script is easy to use and helps you to increase your profits by working faster and more effectively. This script is user-friendly, powerful and feature rich accounting and invoicing software. 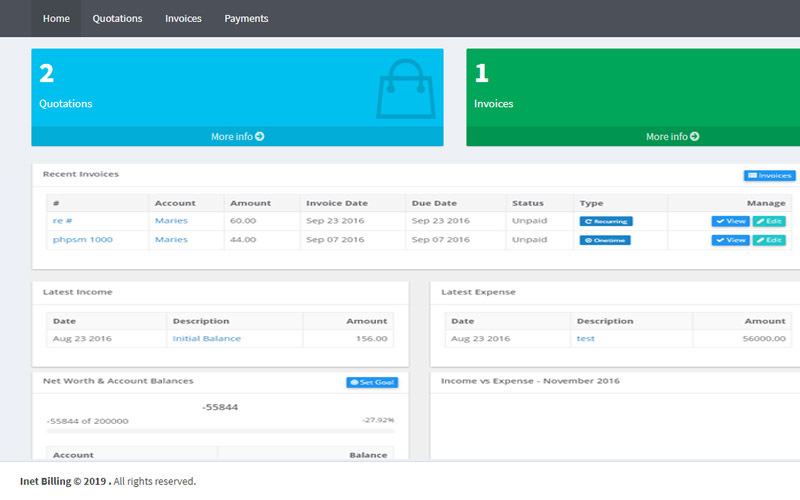 The dashboard of ourReadymade Opensource Billing Scriptconsists of income today, expense today, Income and expense this month. This script has the graphical representation of the income and expense detail. Admin can take different types reports such as account statement, income and expense report, transaction report, reposts by date, invoices, and payments and also admin can collect payments online with our integrated payment gateway.In the transaction menu, the owner can add new deposits and expenses and canview the all the transition details. Without ant technical skills the admin can easily handle and manage thebilling, payment, reports, expenses and more on.Our invoice and billing script is simple to use, accessible from anywhere and anytime. The Client can view all the products and services details in our script. The admin can track records of billing, and set discounts for the customers, set taxes and many more. The core features of our PHP based Invoice Script are Customer contacts, Transactions and balance details, Product and service management, report, Bank and cash details, sales management, CRM management, secure login Account management, secure code, advanced payment gateway integration, powerful admin dashboard, attractive user interface, and more on. The code of the Readymade Opensource Invoice Script is developed on the Opensource PHP and MySQL. The code of the script is optimized with Google standard, so the script is safe from hackers and malware. The customer can modify accounting script according to their requirements and business goals.For this billing script, we provide 1-year technical support, 6 month free updates of the source code and brand free. After purchasing the script, the code will be delivered within 24 hours. We are the right place to deliver the PHP Billing and Invoicing Software to the clients.